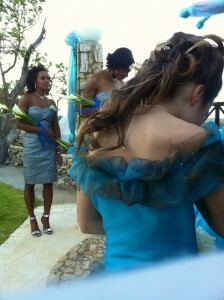 A wedding in Tobago. I was not working, but I was the Best Man and I have a dread of public speaking, especially when it’s something important like this and hardly spontaneous. I had a lot of time to ponder this day and still could not get what I wanted to say written down on paper. On the day of the wedding, with time to kill (which was probably due to me not carrying out some traditional function of the best man) I found myself gravitating to the room where the bride and brides maids etc were getting ready. Now, when shooting a wedding as work this is usually the first part of the job and in many ways my favourite and apart from the obvious reasons why that might be, you do also get a chance to warm up and don’t really need to use a lot of lighting, if any, as makeup artists tend to find the best natural light available. I guess I was technically not supposed to be there, but, as they were actually using my room, I think I had an ok excuse. The truth is that being able to take some pics was better for my nerves than pacing around feeling certain there was something useful I was supposed to be doing, or even, actually getting a speech knocked into some kind of shape. There was an official photographer on call but at this early stage he had yet to show up, so I was not stepping on anyones toes, and it did wonders for my stress levels!